I have something different for you today, a beautiful Blue Iolite in an unusual cut. The stone is five sided. It's not a pentagon as the sides are not equal so this puts it in the "fancy Cut" category! The color of the gem is notable as well. Most Iolite are a very dark blue/purple but this one is a light azure. The color reminds me of some of my Tanzanite gemstones. This lovely stone is 7x7mm with the pointed sides being 6.5mm. It is 1 carat in weight. 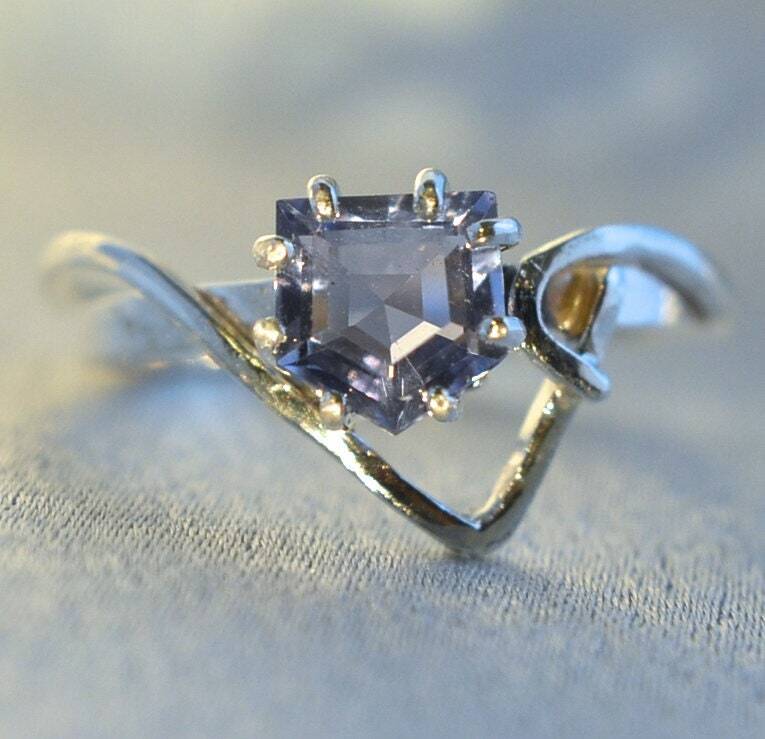 An unusual gemstone deserves an unusual setting. The Sterling Silver band is handmade by me, one tiny piece at a time. I started with a 2mm wide strip of silver and built up the design from there. A decorative wire mimics the stone's shape then curls around the band with a flourish. Life is too short to wear ordinary jewelry!